Home » Top X » Three Must-See Shrines in the Southern U.S.
For Catholics, the importance of shrines and pilgrimages cannot be overstated. Spending time in such a sacred place is a strong builder of one’s faith, and it can be a spiritually uplifting experience. Shrines are often places of thoughtful recollection, both personal and spiritual. Each shrine is dedicated to a venerated martyr, saint or other important figure (most notably, Mary, Mother of God). Of course, the benefits of a pilgrimage to a shrine are innumerable. You get to learn about the venerated figure to which the shrine is dedicated, perhaps attend Mass with other pilgrims, and learn a little about yourself and your faith in the splendor of a relaxing atmosphere. There are shrines all across the globe that are visited by millions of people each year. But, it is rare to think of the United States (and, in particular, the Southern United States) when plotting out a shrine pilgrimage. Many people might conjure up images of basilicas and cathedrals in other parts of the world, but the American South has a lot to offer as well. After all, the world’s biggest Catholic television network, the Eternal Word Television Network (EWTN), was devised by Mother Mary Angelica of the Annunciation in Irondale, Alabama. It was also Mother Angelica who laid the framework for a Catholic shrine in Alabama. The Shrine of the Most Blessed Sacrament of Our Lady of the Angels Monastery is located in Hanceville, Alabama, about an hour’s drive from Irondale and the big city of Birmingham. The shrine was built in 1999 in a distinctly 13th-century, Italian style. It contains a piazza (plaza square), esplanade, colonnade, and a number of different architectural concepts from the era. Most of the materials used in the building of the shrine were imported from other locations like Munich, Madrid, Paraguay, Canada, and others. 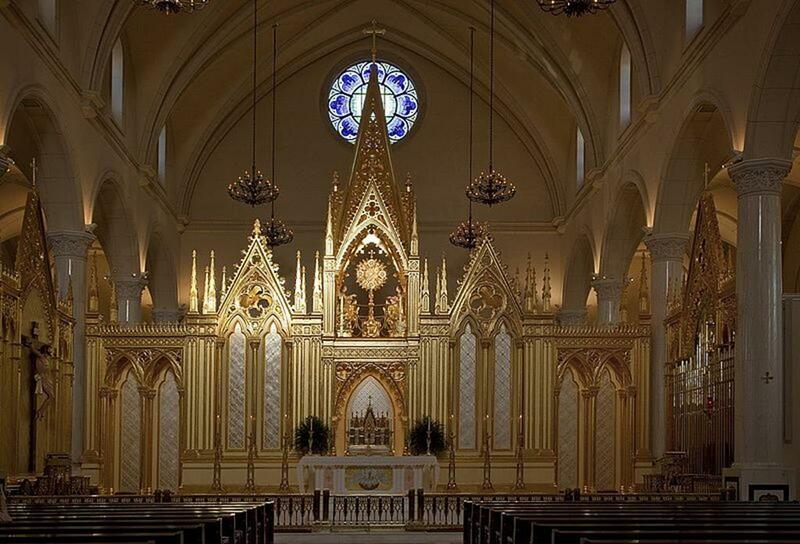 Of course, the shrine is perhaps most notable as the location of EWTN’s Tridentine Mass broadcasts. The Exposition and Benediction of the Blessed Sacrament is also televised at the Shrine. The shrine is named in reverence to the Blessed Sacrament, but the exterior surroundings of the site all honor the Divino Niño (or the Child Jesus). There are also a number of statues of the Child Jesus, one at the side of the altar and another in the plaza square. Mother Angelica, who had at one time hosted shows on EWTN, continues to live at the cloistered monastery in Hanceville at the age of 90 years old. Traveling just one state to the east (and about 150 miles) will get you to the Shrine of the Immaculate Conception in Atlanta, Georgia. A church was built on the site of the shrine as far back as 1848. Attended by largely Irish Catholic immigrants, the church was a basic wood frame structure. During the Civil War, Union General William Tecumseh German ordered all of Atlanta burned to the ground. Father Thomas O’Reilly, the pastor at the time of the war, was instrumental in saving the original building from destruction by Union forces. He also willingly hosted Union soldiers during his masses despite being a Confederate chaplain. When Atlantan refugees came back to their city at war’s end, their houses and livelihoods were all but gone. Fr. O’Reilly along with pastors of other still-standing churches offered refuge to the homeless as they made their way back into town. 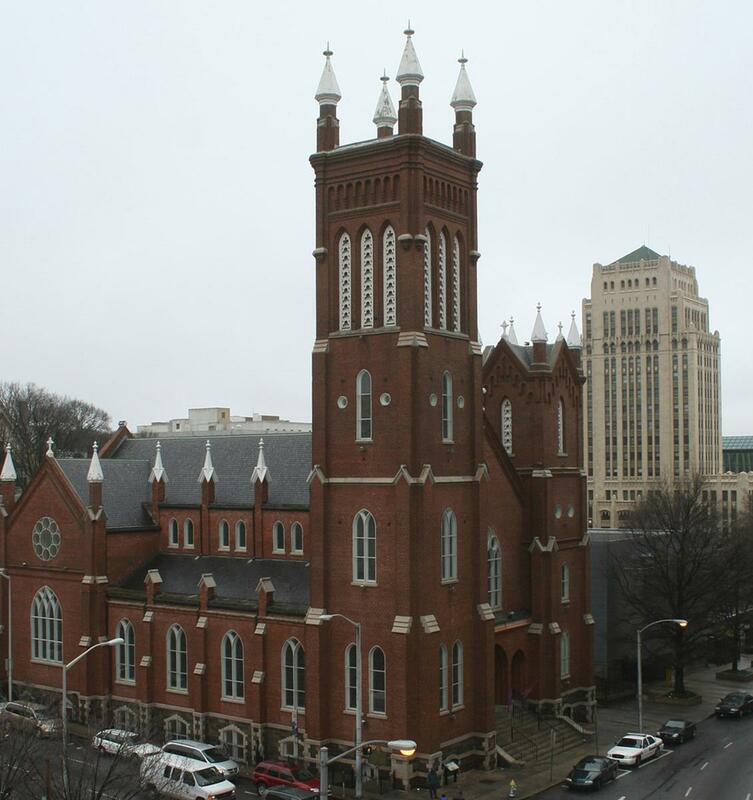 Although the original wood structure survived the war, the building was still damaged, and, ultimately, the Catholic adherents in Atlanta decided it was time to build a new church. The cornerstone was placed in 1869, and the Gothic-style church was ready for use by 1873. It was at that point that the church finally received a proper name: The Church of the Immaculate Conception. The current shrine has survived fires, tumult and nearly 150 years of changing tides. It is still a beacon of hope and solace for all who visit. The Shrine of the Immaculate Conception also regularly holds tours and masses inside its brick walls. Basilica of Mary, Queen of the Universe. Credit. Heading farther south into Florida, you’ll find a much larger shrine dedicated to the Holy Mother Mary. The Basilica of the National Shrine of Mary, Queen of the Universe in Orlando, Florida is one of the most popular shrines in America. This is largely because the shrine itself was built to accommodate the ever-increasing number of tourists in the Orlando area. After the construction of Walt Disney World, it was determined by the Orlando Diocese that tourists needed a place to attend mass. Bishop Thomas Grady and Father F. Joseph Harte saw that the need was abundant and started holding makeshift masses in hotels throughout the area in 1975. As time progressed, both the Bishop and the Father recognized that they were running out of resources and would be better served with a permanent facility. Ground was broken on the shrine in 1984 and the shrine was officially opened in 1993. 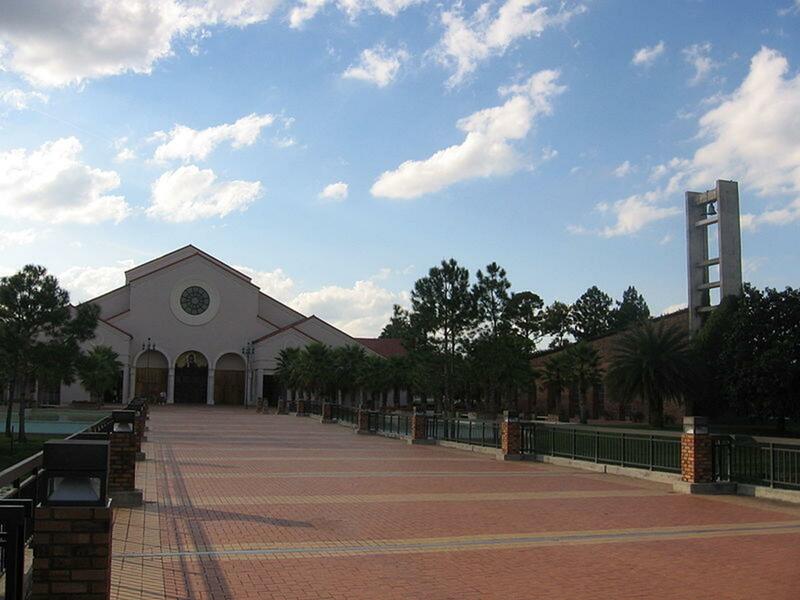 The facility is composed of a 2,000-seat church, the Mother & Child Outdoor Chapel, a serene Rosary Garden, the Blessed Sacrament Chapel, and a museum and gift shop. The shrine is adorned with a number of statues including one entitled “Mother & Child” and another of Christ on the cross. Connected with large, peaceful walkways lined with trees and other vegetation, the shrine is one of the most important in the southern United States. It was named a minor basilica (only the 63rd in the United States) by Pope Benedict XVI in 2009 because of its outstanding ministry to hundreds of thousands of Catholic tourists from around the globe. It has also been a welcome sight for many pilgrims making their journey to the location. The Catholic presence in the American South is abundant, and there are plenty of shrines to see on your journey. Whether you want a tourist hotspot like the National Shrine in Orlando or you are just looking for a shrine that has stood the test of time like the Shrine of the Immaculate Conception in Atlanta, the South has a lot to offer. Combining beautiful architecture, serene settings, impressive statuary and stunning works of art, these shrines can all be a valuable experience for Catholics.